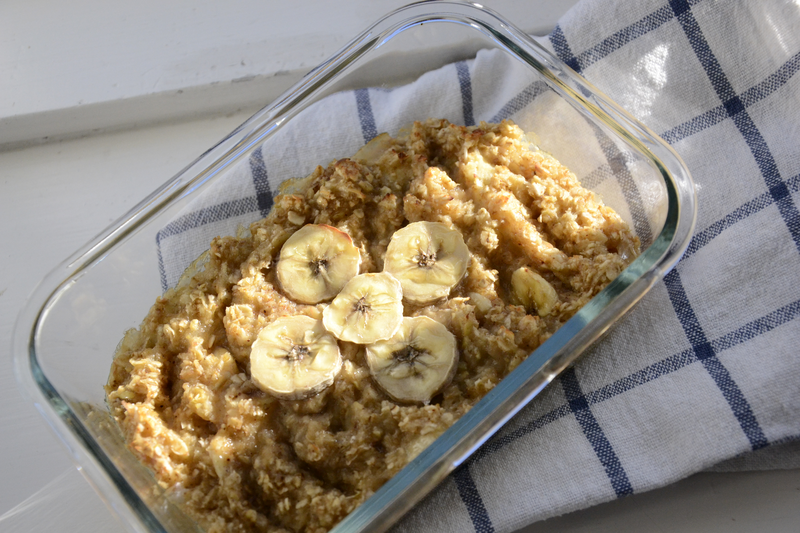 Another oatmeal recipe? Again? It might look as if I am completely obsessed with oatmeal and guess what: even after eating steaming, hot and comforting bowls of oatmeal everyday for the past two months, I haven’t grown tired of it. There are many different ways to prepare oats and thus there are no limits to my creativity when it comes to breakfast food. Oats are a healthy, filling and cheap way to start your day. They are loaded in dietary fiber, minerals and other nutrients. They also help reduce high blood pressure, have cholesterol-lowering effects, thus reducing the risk of heart disease, plus they are gluten-free. Give me one reason why we shouldn’t enjoy more of this goodness. This recipe takes a bit longer to prepare than my last oatmeal recipe, it therefore might be more suitable for a nice breakfast on the weekend, but it’s incredibly easy to make and tastes delicious. Of course, you can substitute the fruits I used with any fruit of your taste but I happened to have apples and bananas at home. 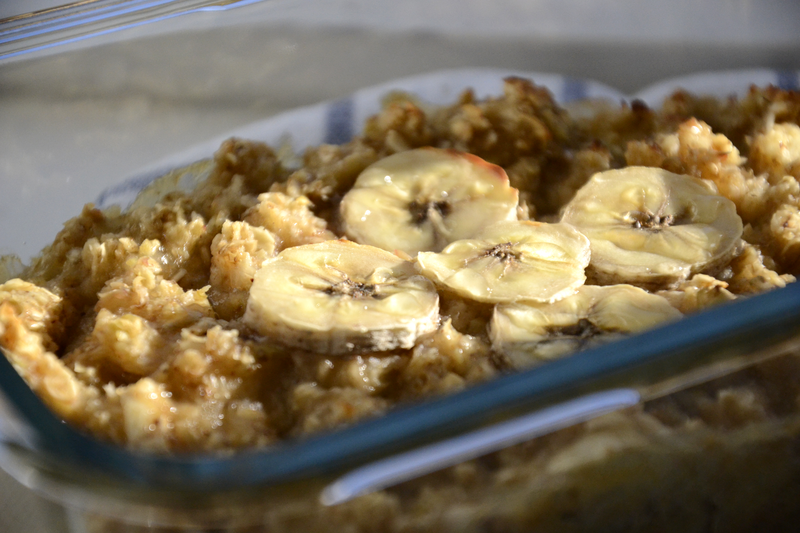 The apple adds a bit more fluid to the mixture and the banana gives the oatmeal its creaminess. Preheat the oven to 190ºC (370 Fahrenheit). Cover oatmeal with boiling water and let soak for a few minutes. If you feel like the oats absorb lots of water, add a bit more. Also, make sure to use real oatmeal, meaning the small-flaked oats instead of coarse oatmeal because the latter cooks very differently and won’t give you the intended creaminess. While your oats soak, finely grate your apple and mash up your banana. I never peel my apples because I simply don’t get why people would dump the best part of the apple, containing all those healthy vitamins. 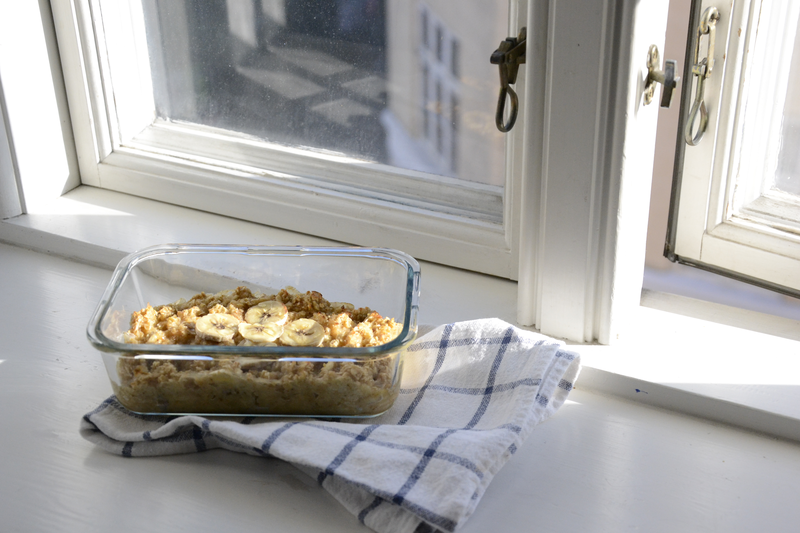 Mix soaked oats with your apple and banana, add cinnamon and maple syrup to taste. If you feel like the consitency is too thick or if your apple isn’t juicy enough, you can always add a bit of milk or some more water to make it creamier. If you use nuts or raisins, add them now and stir well. If you are already starving, you can also eat the mixture without baking, but trust me, waiting for a bit longer pays off. Pour the mixture into a little oven-proof dish and flatten it a bit with a spoon. Bake for about 20 minutes until slightly golden. Let cool for a few minutes until it’s not burning-hot anymore and enjoy!